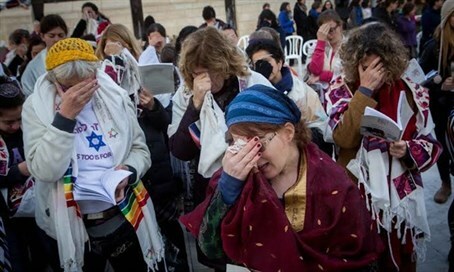 Petitioners ask High Court to stop 'offensive and insulting' Priestly Blessing ceremony to be performed by Women of the Wall. Bet Tzedek legal service organization together with Rabbi Yitzhak Cohen, a resident of the Old City of Jerusalem, filed Monday a petition to the Supreme Court (High Court) to prevent the Women of the Wall organization from holding a “priestesses blessing " ceremony at the Kotel (Western Wall) during Passover. The petitioners argue that the planned activities of the Women of the Wall goes against the Protection of Holy Places law and is therefore illegal. They further argued that the format of such a ceremony is unknown to Jewish law, as there is no custom of “priestesses blessing" nor a role of a priestess existing in Judaism. The petition further described the ceremony as “ridiculous, absurd and detached from Judaism” and that such “offensive and insulting” practices are being advertised by organizers to honor of the late Leonard Nimoy, who portrayed the half-Vulcan character Mr. Spock on the original Star Trek television series where he popularizes the “Vulcan Salute” based on the Jewish Priestly Blessing hand gesture. The petitioners argue that the Women of the Wall are diminishing the significance of the prayer as they advertised that Nemoy “took something precious and ancient and brought it into the 'future' ... and thus brought a message of Jewish belief and turned it into a universal message of peace and prosperity". "It is easy to see that the event which the Women of the Wall seek to hold is not what it purports and the prayer event is not made in good faith. This event aims to ridicule the Jewish religion, to reduce the significance of religious worship in its present archaic and folklore practices" the petitioners added.